Some devices don't show the icon in the normal notification bar, so you have to drag down the notification to see the % of your battery. 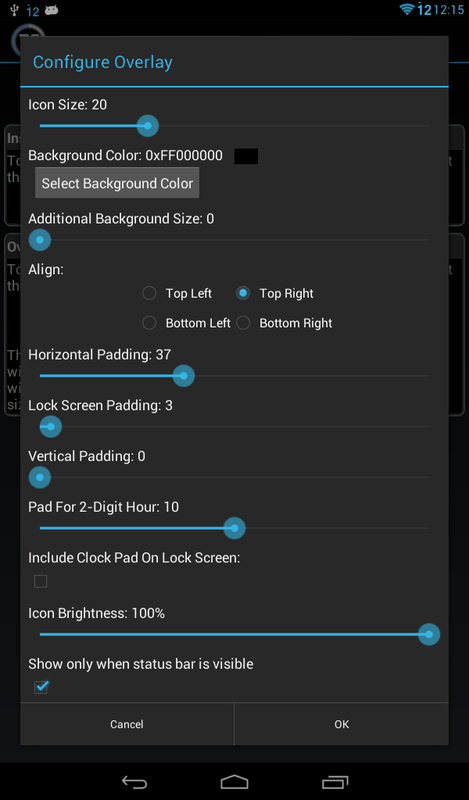 A lot of custom ROMs for your phone/tablet support a 'mod' that allows you to control the battery icon itself. Great for those who have it - but this brings you similar function without rooting your device! The overlay shows up on your lock screen - so no more unlocking your phone just to see your battery %. Some phones already show the battery % in the lock screen, but a lot don't. Select Overlay Standard Battery Icon. You should now see the icon in the top right corner if your screen. Select Configure Overlay Icon to further configure the size and location of the icon. Icon Size: This controls the size of the icon itself. Move the slider around to see the size change and get it just right. Background Color: This controls the background of the icon. Some of the icons are transparent, so setting the background color to Black will ensure the background battery doesn't show through. Move the 'Alpha' slider all the way down to gain full transparency. Additional Background Size: This is similar to icon size, except it adds a padding to the icon using the background color. This allows you to have a smaller icon, but still cover a larger background. Align: Generally Top Right is the correct location, however every device is different, so place it where you want. Vertical Padding: This controls how far away the icon is from the top (or bottom) of the screen. Pad For 2-Digit Hour: Most devices have the clock all the way on the right, so when the time changes from 9:00 to 10:00, the battery icon moves to the left. This lets you control how much padding that extra digit requires, and the icon will automatically move depending on the time of day. 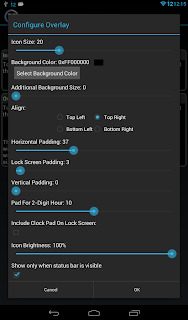 Include Clock Pad On Lock Screen: For devices that show the clock on the lock screen in the same way as when unlocked, this lets you enable the Pad For 2-Digit Hour on the lockscreen as well. Most devices don't do this, so this is disabled by default. Icon Brightness: You can dim the icon if it's too bright to better match the colors elsewhere on the status bar. Show only when status bar is visible: When apps go into Full Screen mode, the icon will disappear by default. This is typically what you want, however toggle this to make sure the icon never gets hidden. NOTE: Some devices (Nook Tablet & Color) where the status bar is not at the top of the screen don't support auto-hiding, and so this MUST be checked on these devices. Hopefully there aren't may such devices. Suggestions? Feel free to email me with any additional features, or let me know (with a screenshot) if things don't work. You can find my contact info in the About section on the blog. I configured this to go oevr the battery icon in the upper right on my Kindle Fire 8.9", but as soon as I said ok the icon went away. Also, I can't find the preferences menu. 3) Select the Battery Icon Theme option and make sure you select on of the icons from the icon pack. 4) Select 'Overlay Standard Battery Icon' to have the icon overlay support. I have pro version and icon pack and can't get overlay to work on my Asus tf300. Any help would be appreciated. Overlay changes system files breaking OTA? Is possible to revert it back like I never changed anything? I have thy overlay in the top right corner but after awhile I get a smaller version showing on the left as well as the right. Icons are very useful if you use apps. They allow to neatly store things on a workplace and be ready to activate at a moments notice!